Rectory Gardens was supposed to be demolished in the early 1970s and turned into an old people’s home. The council bought the houses by compulsory purchase order but then couldn’t afford to knock them down. Not wanting to be lumbered with empty, derelict properties, the council let the squatters who had moved in stay on as ‘short-life’ tenants. They formed a housing co-operative. Many are still there forty years later. Property prices in the area, like everywhere in London, have soared: a three-bedroom flat in a gated development next door sold for £979,000 in May. It isn’t surprising that Lambeth Council wants the houses back. It has offered priority rehousing to anyone who agrees to leave Rectory Gardens, ahead of many of the 20,000 people already on the waiting list. When they go, a property guardian moves in. Camelot advertises ‘fees’ (not rent) from £35 per week, but in London the price is likely to be far higher: £408.90 per month to live in a former care home in Hackney, for example. This may be low by the standards of the private rental market, but as they’re neither tenants nor employees, guardians have none of the rights of either. They can be evicted at extremely short notice, inspected and fined for being messy. They can’t spend too many nights out and can’t bring guests round without booking them in. Guardians in Rectory Gardens are lucky: most of the houses have been carefully restored over the years, though residents still describe the street as ‘ramshackle’. Elsewhere, guardians can expect far worse than ramshackle. Camelot boasts to speculative clients that their guardians are ‘flexible and adventurous’ and can live almost anywhere. Camelot started in the Netherlands in 1993. Its co-founder, Bob De Vilder, came up with the idea of property guardians while squatting himself. The company moved into the UK in 2001. Bond Precaire Woonvormen is a Dutch organisation that campaigns against property guardian – or ‘anti-squatting’ – organisations. Abel Heijkamp, who works with them, says that companies like Camelot are ‘violating tenants’ rights on a massive scale, resulting in a growing group of second class tenants’. 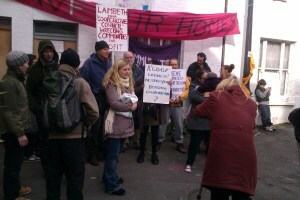 By making it easier for councils to break up communities like Rectory Gardens, by undermining squatting and eroding tenants’ rights, Camelot is improving its own prospects; as more people become desperate for a place to live, an increasing number will forgo their right to be a tenant – let alone their tenants’ rights – to live in places many people would consider uninhabitable.